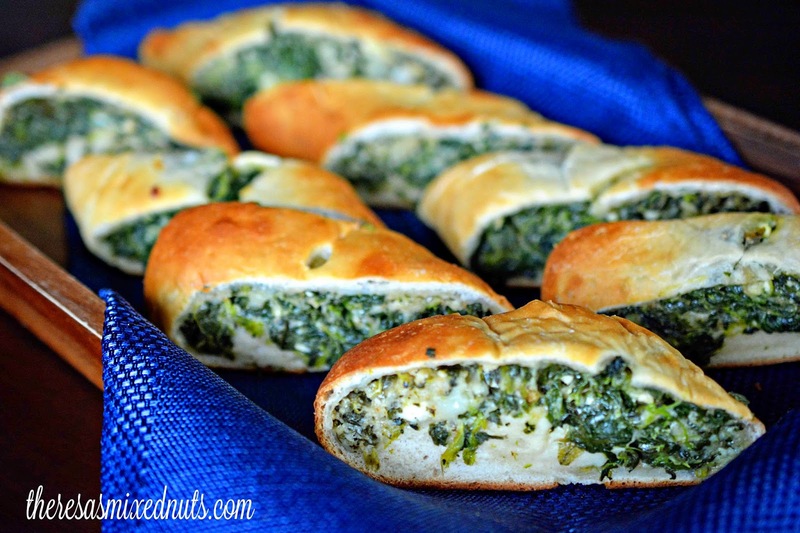 Theresa's Mixed Nuts: Serve These Scrumptious Spinach & Cheese Rolls For Easter Dinner! 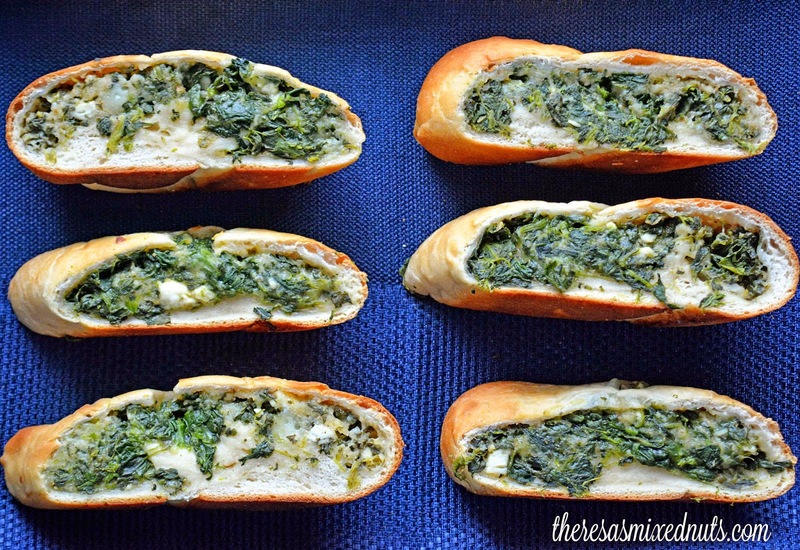 Serve These Scrumptious Spinach & Cheese Rolls For Easter Dinner! My whole life, I hated spinach. Then something changed about 2 years ago, and like Popeye, now I just can't get enough of it! I usually like to mix it in with my pasta dishes (it's so tasty in my stuffed shells recipe!) but I've been coming across a lot of recipes that call for spinach that really intrigue me lately. I saw this Spinach and Cheese Roll Recipe over at Golden Blossom Honey, and thought "Hmmm, that might be a good addition to our Easter dinner table this year." I did a test run this week, just to be sure, and it was a real winner! I have tried many amazing recipes from Golden Blossom Honey, but this one has been my absolute favorite so far. Not only was it really easy to toss together, the cheese and spinach all tucked into the bread was like Ka-Pow in your mouth. So. Dang. Good! Do you like spinach? Do you think this recipe would be a good addition to your Easter dinner? The honey really isn't overpowering at all. I think it really has the perfect flavor combination! And I am really going to have to try your rolls too! They sound mmmmm! just an egg in it too, I forgot to mention it :) And I bake them, not fry them. Baking does sounds like the way to go. I am not overly fond of fried foods, though we will have them on occasion. Awesome! Thanks for the detailed instructions! Just copied it all down to try soon! Awe, thanks for visiting and your sweet comment! See, then we know it's a winner if Pat will eat it! I don't want to wait all the way until Easter for these. OMG, they sound amazing. They really are. I may make another batch and have more before Easter myself! I came over to see what the recipe for today was, and I'm oh so so so glad I did. Pinning and making this one. Let me know how you like the Rosey! Oh, this sounds so good. I love spinach and cheese! Yum yum yum! 3 of my favorite foods of all time in one, this is a must try for me! Yummy. These looks so tasty. My guests would surely love them. I LOVE spinach. I need to pin this. I've never seen this type of dish. I love spinach. This recipe looks amazing, a must try! Yes I love spinach! I'd love to make these for my Easter dinner. They are right up my alley! Spinach and cheese is a great combo. I can't resist it. My mom makes something similar to this and its amazing. I'll pass along the recipe. These look delicious. I love a spinach and cheese combination. That sounds so good! I'd love to try one. I love Spinach and I know that I'll love this. I know the kids aren't fans but with the cheese they'll actually like this too. Thanks for the recipe. Oh wow these look delicious! I love everything about this. Plus it's different, will have to give this a try! definitely give these a try. I love these spinach and cheese rolls. They are the perfect bite-sized snacks to enjoy throughout the day. OMG. I love spinach and cheese combination. I've never had it with a little bit of honey. I'm envisioning the flavor combination. Sounds interesting. Does that Spinach cheese roll ever look good. It reminds me of a spinach pie I get at a Sirian restaurant near me. These look really delicious! The use of honey is interesting... but I guess I can see it working with the cheese. Great post! This is an interesting collection of ingredients, and the end result looks really good. I will have to click on this to see where the egg fits in. I am a huge fan of spinach! Here's my secret to in cognito spinache munching.... All you need is someone to make you smoothies. Angie, my Bollywood Princess, bought herself a $600 machine in her favorite color red to make delicious smoothies. I had no idea she also put spinach in my smoothies. They all taste like blueberies or strawberries... but it turns out she put spinach in them as well. So I guess I like spinach when I don't taste it! Oooh, Angie is so sneaky! Sounds like she knows how to make you eat what's good for you, even if she has to trick you into it! Yeah, she does. I'd prefer some of her pie though. I love, love spinach and add to almost everything. These spinach cheese rolls looks delicious and I make a similar one with puff pastry. I love the sweetness honey adds without being overpowering. Thanks for sharing your recipe!